I'm excited to announce the release of my first book! ReVisions contains seventy-three stories that can be used for daily meditation, to inspire discussion in therapeutic groups, to support themes of pastoral presentations and lectures, or simply to immerse oneself in the lyrical prose. I plan to facilitate workshops using the book. Read more and order here. My apologies for not keeping up with this website. In the past four years I have been nose to the grindstone as an addictions therapist at The Ranch in Nunnelly, TN, where I have had a long association for the past eighteen years. But inspired activities do continue. There have been occasional performances in Tennessee, Massachusetts, Arizona and California. A screenplay was optioned three years ago but financing issues prevented production. The musical "Nanyehi" continues to be presented, and it was recently on stage at the Hardrock in Tulsa, OK. I continue to use music, art, and creative writing in therapeutic ways on the job. And, of course, I'm proud to be releasing my first book, ReVisions, this month. Thanks for your continued support! It has been an extraordinary year, most importantly because I am now eight months post-op from my heart surgery. Prior to entering Vanderbilt University Medical Center in April, I had a wonderful opportunity to reflect on my life. I found that I was content with many aspects of my personal evolution over the years but I was also aware of ways I had been holding myself back from living a full life. After surgery the medical staff often remarked at my amazing recovery. I credit this to a deep and rekindled determination to live, greatly enhanced by the light, love and prayers that were sent my way by friends like you. I was back to work in two weeks! As I look forward, I see my path as something to glide upon rather than trudge. I have raised the bar for myself and set new goals. I am looking forward to traveling again, presenting songs, and journeying to spiritual places, perhaps in the Grand Tetons and the Andes. I recently learned from Becky Hobbs that her newly released album "Nanyehi - Beloved Woman of the Cherokee" has been nominated for a Grammy Award. A song we wrote together, "This Land Is not Our Land", is featured on the project. The song is also being used to promote conservation of our natural resources. To learn more about Becky and to order the CD visit www.beckyhobbs.com. The National Museum of the American Indian recently awarded a grant to the producers of the musical "Nanyehi - Beloved Woman of the Cherokee." It is based on the life of Nancy Ward. "This Land Is not Our Land", a song I wrote with singer/songwriter Becky Hobbs, is featured in the play. Becky, a descendent of Nancy Ward, co-produced the project and it has received much praise. It was selected recently for Reading and Musical Presentations in Tahlequah, OK and Guntersville, AL at the reception for the National Trail of Tears Association Conference. The play is now in production. To learn more about Becky and this project visit www.beckyhobbs.com. The Bring PEACE Not Pain organization has released the results of their Peace Song Challenge. Thanks to all of you who voted. "I See the Light in Everything" tied for the First Place People's Choice Award. For more information about Bring PEACE Not Pain visit www.bringpeacenotpain.com. Last month I spent ten days in California and presented songs in Cambria, Arroyo Grande, Thousand Oaks, Tustin and San Diego. I had the opportunity to visit old friends in Los Osos, Burbank, Pacific Palisades, Seal Beach and Dana Point. I have so much gratitude to everyone for making this such an amazing journey. I returned home with an abundance of light and love and so many new friends. I look forward to the next visit! Oliva Del Rosario offered to take photos while I presented at the San Diego Center for Spiritual Living. View some of the photos here. You can see more of her photography Here. I have only seen Bald Eagles on the Piney River three times during the nine years I have lived on a nearby farm. In late January I noticed one perched in a tree near my office. Fortunately, I had my camera (I like to keep it handy for the unexpected nature shots). 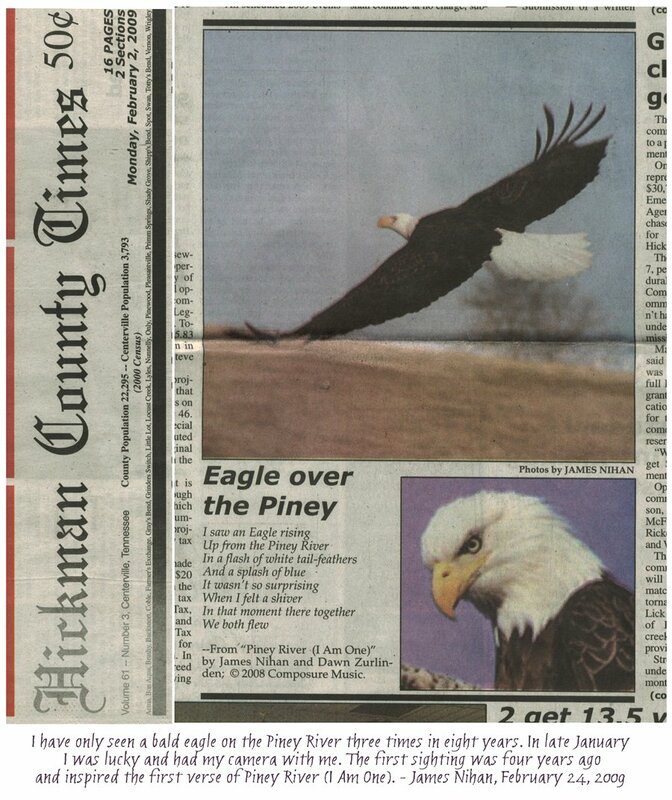 Later, two of the photos were published on the front page of the Hickman County Times along with the first verse of my song, "Piney River (I Am One)." See it here. In August, my old friend, Kathy Marchetti, spent several days in Barrow, Alaska, with members of the Unupiat tribe, who have lived on the North Slope of the Arctic for thousands of years. With camera she was able to document these warm people practicing their traditions, including prayers and ceremonies and hunts for caribou and walrus. The trip was sponsored by the Peabody Essex Museum in Salem, Massachusetts. I was honored to lend my voice in recitation of the twelve core values of the Inupiat. Barrow is the northernmost city in the United States. While in Santa Rosa, California in August, I had a chance meeting with Sandee Snider. She informed me that Doug had passed away last year in his hometown of Bend, Oregon. It was Doug and Sandee who, in 1987, gave me the encouragement to finally move to Nashville to seriously pursue a songwriting career. They put me up until I got settled and later an introduction to Wood Newton would lead to the collaboration resulting in the successful "I Can See Arkansas". Doug had worked as a drummer in his early years, had worked at Warner Brothers, cowrote and produced many songs with Leon Russell, was a deal maker and wore several other hats. He was preceded in death by his friend, fellow Oregonian and songwriting Hall of Famer, Mickey Newberry. I will remember Doug as a good friend who left this world before his time. Charlie, my pal at The Ranch, died in September after a long struggle with cancer. He arrived in Nashville in the 1960's and kicked around with the likes of Kris Kristofferson. His first road gig was playing with Sleepy LaBeef. In recent years, 30 of them, he backed up the late Del Reeves on the Grand Ole Opry. Dawn and I had the opportunity to perform several times on Charlie's Saturday morning radio show (KIX 96) that continues to draw crowds at the Chamber of Commerce on the town square. Charlie's slogan was, "Check your ego at the door." He was a kind man with great humility who spoke his truth with gentle words. We'd often stop to shoot the breeze and discuss life, even as his condition worsened. I hope as I continue on my journey, I can personify many of the attributes I saw in Charlie Garner. I just want to report that all went well with the recording of Murals, the third project inspired by spiritual teachings, new thoughts and ceremonies. One of the songs, Hovenweep, about the ancient Anazasi, began lyrically in a lucid dream. 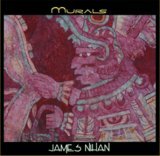 Jaguar Mural is the story of where I went while dreaming in Teotihuacan, Mexico in the temple of Tatetla. The musicians have complimented the songs beautifully, including... Ron de la Vega, a cellist who has backed up Nanci Griffith and others, lent his passionate talents to three songs, including Three Petals, a song about a Peruvian despacho ceremony. Duane Sciacqua, who has played guitar for Paul McCartney, Glenn Frey, Rodney Atkins and others, again also engineered and co-produced. Becky Hobbs was coaxed into playing accordian on Piney River. Dawn Zurlinden added harmonies and co-created three songs. Hear song samples from the Merchandise Page. Order a copy now! I just learned that in late 2007 Greensleeves Records (England) released the CD "Monsters of Dancehall" by reggae dancehall artist Ninjaman (Desmond Ballentine). It included, once again, the James Nihan/Wood Newton cowrite "I Can See Arkansas." The Jamaican artist first released the song as "Mississippi (I Can See Arkansas)" in 1992 on the album "Ting a Ling a Ling a School Pickney Sing Ting," produced by Junior Reid. At the time, a record label promo pronounced, "Rush release due to public demand. This may be the most outrageous slow jam single of '92," and "Includes a full vocal lick from Marcia Griffiths and Judy Mowatt and the only vinyl release of Ninjaman's 'Bring In the Gun.'" Hey, I didn't even know I had anything recorded on vinyl. Visit Greensleeves Records here. I had a wonderful time on my recent journey north, where I had opportunities to present songs and visit family and friends. I want to give a special thanks to Noreen Cullen and David Gonci, Ray and Susan Shea, Laural Workman, Keshav Howe, Rita Rivera Fox and Ed Fox. Each year, the Association of Unity Churches International's music ministry team produces a new songbook of the best new thought music they can find from hundreds of submissions. In notifying me back in January, Richard Mekdeci, with the Sacred Music Resources, said, "In fact we loved your song and the title so much, we are planning to name the songbook Seeds Of Light!" Isn't that sweet?! To read about the song and view the lyrics click here. Check out Unity Church and order the songbook. I've been told the mind is like a hard drive. And, Lord, the things we download! I decided to get rid of some data that's been just taking up space amongst the cranial cobwebs. That data is uploaded here and presented as a list of past performances, to the best of my recollection. There, I feel better now. Click here. I was rummaging through a box of old photos and newspaper clippings at home and I came across a Salem (MA) Evening News article from October, 1981. It was about society bandleader Peter Duchin, with references to his late father, Eddy Duchin, the renowned swing and bigband leader and pianist. Eddy died in 1951 and the movie The Eddy Duchin Story, starring Tyrone Power and Kim Novak was released in 1956. His theme song was "My Twilight Dream." 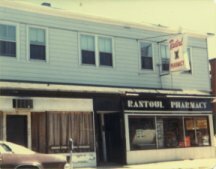 Anyway, Eddy once lived in Beverly, MA, my hometown, and to quote the article, written by Betty Munro: "Beverly residents recall when the elder Duchin practiced over the Rantoul Street Pharmacy�before his musical career took off." It happens that in 1977-78 when I was nineteen, and just setting out on my musical journey, I lived in an apartment above the Rantoul Street Pharmacy, playing in local saloons and coffeehouses while honing my songwriting skills. It was here that I composed some early creations like "Goodwill Box Hobo," "Sweeter than a Pie" and "Dusty Boots." I got an e-mail recently from co-writer Wood Newton. Apparently our old song was recorded yet again for, I think, the fifteenth time. It was released by an artist in Memphis named, get this, Cole Porter! Yes, I can now say I have a Cole Porter cut. Now...are there any young recording artists out there named Hoagy Carmichael or Johnny Mercer who are looking for songs? The project was produced by the fabulous stage and studio pianist Ronny Godfrey, whose musical exploits include being a member of the Marshall Tucker Band. I recall Ronny in the studio back in '98 when my co-writer, Monty Lane Allen, was cutting some sides with producer Frank Rogers. This was back when Monty and I were writing on staff at EMI. During the session two of our collaborations were recorded: "One Step Closer To Love" and "To Take Away Our Love". The benefit for Dunbar Cave was a wonderful experience. I lent my music in support of the of the event, which included the signing of Larry Matthews' newly published book, "Dunbar Cave: The Showplace of the South." Money raised will be included in a fund to build an Interpretive Center that will feature many Native American artifacts found in the cave. The mouth of Dunbar Cave featured a stage for many years and entertainers, including Lena Horne and Benny Goodman, appeared there. During the 1960's, the cave was owned by Country singer Roy Acuff. Read the Leaf-Chronicle newspaper article. I took my time with this one. We began recording in June, 2004 at Duane Sciacqua's studio in Nashville. The players included Duane (electric guitar), Christy Martin (sitar, hammered dulcimer), Aodh Og O Tuama (pennywhistle, gemshorn), Kevin Ball (djembe), Gantt Kees (drums), Brian Hinchliffe(bass) and Dawn Zurlinden (vocals, keyboard). The songs you may recall from performances this past year...titles such as Dragonfly, All Creation, I See The Light In Everything, Desert Dream and Seeds Of Light. I am very excited about this project. Read notes, hear song samples and view the lyrics here. Order your copy by sending check or money order for $15.00 to: James Nihan at P.O. Box 282, Lyles, TN 37098 ...or... Buy now by credit card at CD Baby. Exciting news! Recording artist David Ball recorded the Wood Newton/James Nihan song "I Can See Arkansas" for "Freewheeler," his new album on Wildcatter Records. The project was produced by Wood. (Trivia: Wood's name was adopted on the TV show Evening Shade for the character played by actor Burt Reynolds.) David has previously recorded for the Warner Brothers, RCA and Dualtone labels. You will no doubt remember hits like "Thinkin' Problem" and "Riding With Private Malone." (Trivia: Years ago David sang and played the upright bass as part of Uncle Walt's Band with the late Walter Hyatt.) Past artists who have recorded the song include Steve Wariner, Anne Murray, Larry Stephenson and reggae artist Ninjaman. You can visit David's website here. I thought it would be interesting to see how good my recall is. From Roy Acuff to Carl Yrztremski, here is a list of celebrities I remember meeting along the way. They are recording artists, folk singers, songwriters, actors, comedians, directors, producers, sports celebs and more. Click here to see what I came up with. Jess Leary - Jess has collaborated with and/or had songs recorded by Janis Ian, Melanie, Pam Tillis ("Mi Vida Loca"), Lari White, Tim McGraw ("Where The Green Grass Grows") and more. Gary Burr - Gary has worked with everybody from Carole King to Ringo Starr to Richard Marx. Recently his song "Nobody Wants To Be Lonely" went #1 on the Latin Charts as a duet by Christina Aguilera and Ricky Martin. Other artists who have had hits with his songs include Leann Rimes, Randy Travis, Conway Twitty, Patty Loveless and George Jones. Peter McCann Peter signed to Motown Records at 21. He had a hit with "Do You Want To Make Love?" in the early 70's. Artists who have recorded his songs include Whitney Houston, Isaac Hayes, Anne Murray, Jennifer Warnes, Kenny Rogers, Earl Thomas Conley and Julio Iglesias. He wrote a beautiful awareness song for the National Center for Missing and Exploited Children (NCMEC). It was sung by Michael McDonald and Kathy Mattea. Barry & Holly Tashian - Wow! They've been married and making beautiful music together for almost thirty-two years. Barry began with his group The Remains in the 60's. They were on the Ed Sullivan Show and also the Beatles opening act for their last tour. He also worked on Gram Parson's release "GP" for Warner Brothers and performed in Emmylou Harris' Hot Band for several years. Barry & Holly are on Rounder Records. Dennis Crouch played upright bass. Deborah Adams - She recently had a song featured in a Jennifer O'Neal movie. "Under The Rainbow" and "My Heart Wrote That Song" were recently released in the Netherlands on a new CD by Nash Music recording artist Kathy Bloom. Rocky Dee released "If I'd Known You Felt This Way" on Door Knob Records. "I'm Your Man" was released by Michigander Donny Hyder on a new CD for Nashville label, AMI Records. The CD is entitled "Listen." James and his song "Flying," from the CD "Rays of Light," were chosen as semi-finalists in this songwriters music festival, which was held on the weekend of August 20-22 at Claymont Court, an historic estate in Charles Town, West Virginia. Fellow songwriter and longtime friend, Kevin Ball, accompanied James on the djembe (African drum). For more information go to: Mountain Stage Newsong Festival. The CD is a fundraising vehicle supported by the Veterans National Coalition for the Homeless and features 12 songs performed by various artists including T. Graham Brown, Lane Brody, Moe Bandy and the Corbin-Hanner Band. "Letter To The Front", cowritten with Jeffrey Alan Chase in 1991 during Desert Storm, was originally called "Letter To The Gulf". Producer Jim Allison has cut a wonderful version of the song on recording artist, Sheri Jo Porter. Profits will benefit homeless veterans and the planned WWII memorial to be built in Washington, D.C. in the near future. To visit Veterans Outreach and order this CD click here. This much anticipated CD contains "A Ray of Light", "I Am An Artist", "Golden Eagle", "Sister Mitote", "Sacred Hoop", "Storyteller", "Don't Take It Personally", "Love or Fear" & four other inspired songs. Instruments include djembe, dumbek, steel drum, cello and Native American flute. The project was begun in September, 2002, with the encouragement of John Carter Cash, who generously brought me into the Cash Cabin to record. We began there, putting tracks down on six songs. After several later delays that were a blessing in disguise (I wrote a few new songs during that time. ), I returned to the studio again in May- this time in Nashville and my engineer was Duane Sciacqua, former lead guitarist for Paul McCartney and Glenn Frey. Duane is married to Country singer/songwriter Becky Hobbs, a co-writer of mine. For more information click here. The recording artist was in the studio recently putting the final touches on a CD to be released in late spring. The album will feature all James Nihan songs including "Wet Cement" and "The 4-H Club" (James Nihan/Robert Ellis Orrall) - "Lay Down Your Arms", "I'll Show You" and "These Days Those Days Are Gone" (James Nihan/Don Ellis) - "I Even Believe In Love" (James Nihan/Pebe Sebert) - "She Put Her Foot Down" (James Nihan/Jeffrey Alan Chase) - "What Is Love Without You" (James Nihan/Jim Collins) and "Go In Style" (James Nihan/Mark Irwin). "One Way Ticket" and "Myrtis Young" were recently recorded by Jessica Taylor Storm. Produced by her husband, Tom, she performs in the New Hampshire area. The album is slated for release shortly. World Champion Bullrider, Donny Gay, records song. In October, 2002, NLT Records released an album of rodeo songs. All songs are sung by various World Champion rodeo riders-the ladies as well as the men. Eight-time bullriding champ, Hall of Famer Donny Gay, who hails from Mesquite, Texas will recites the lyrics to "God Bless The Rodeo Clown" (James Nihan/Cheryl Durham-Owen), while the old cowboy standard, Red River Valley, plays in the background. Others lending their voices to this project include Larry Mahan, Fred Whitfield and Sherry Cervi. A portion of the proceeds will benefit injured rodeo riders and their families. To order this CD click the rodeo link on the home page. "I Couldn't Say" was released by Rich Green on Wild Oats Records. Released in fall, 2002, was "And Then Some", on the CD, No Tears, by Florida recording artist, Cole Seaver. This CD can be purchased at CDBaby online. Jennifer Leigh Meyers, a young recording artist in Louisiana, produced by her dad, Keith Meyers, released a debut album in 2002, featuring the song "Under The Rainbow". This CD can be purchased at CDBaby online. "Under The Rainbow" was also released by the female duo, Shylo, who are from Missouri. "These Days Those Days Are Gone", co-written with Don Ellis, was released in June by Outback Records recording artist, John Colbert. Two Nihan songs recorded by Jaci Rae on her new CD, Can't Push A River. This album was released by the NSR label and contains twelve selections, including the James Nihan tunes "Goin' Till I'm Gone" and "Under The Rainbow". Jaci Rae delivers fine performances from start to finish. I especially enjoyed the Willie Nelson penned "Crazy" and a rollicking countrified version of Bob Dylan's "Don't Think Twice". To visit Jaci Rae's website or to order this album click here. To hear a sample of "Goin' Till I'm Gone" click here. To hear a sample of "Under The Rainbow" click here. Two songs were cut by Bill Clark on Wild Oats Records and released January, 2002. The album is called Tomorrow The World and it is a collaboration of three recording artists. Bill recorded four tracks for this project including my songs "Back In The Picture" and "If I'd Known You Felt This Way". Bill hails from Michigan. To visit Wild Oats Records and read more about this album and to hear a sample of "Back In The Picture" click here. "Whoa! I just read the lyrics to "Bells of Santa Rosa" and I do believe it is one of the finest set of "picture painted lyrics" that I have ever read. Congratulations for making my evening." On June 15th and 16th I performed at The Swallow At The Hollow, a club in Roswell, Georgia, a suburb of Atlanta. The booking was coordinated by the Bluebird Cafe in Nashville (Congratulations to the Bluebird, by the way, on being voted recently as Club of the Year by the Acadamy of Country Music!) I traveled down with songwriters Lisa Palas ("You've Got The Touch" - Alabama) and Ed Bruce ("Mammas Don't Let Your Babies Grow Up To Be Cowboys") and my wife, Dawn, who gave me an assist in the singing department. A good time was had by all. It was especially nice to visit with my cousin, Leslie Jedrey, who lived just five minutes away. My ol' buddy and mentor passed away this week at the age of 74. He was known on Music Row as the Irving Berlin of Country Music, having thousands of songs recorded. 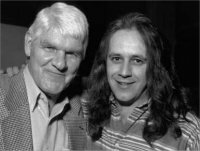 When Harlan and his wife, Melanie, were kicking off a new publishing company back in 1990, he called me about my song, "Brothers Of The Wind", written with Jon Hansell. They wanted to publish it. For the next five years I brought my songs to Harlan and Melanie. He would critique them, demo them and plug them alongside his own songs. I also worked in their office at home, where I had the chance to meet many of the music biz crowd. You never knew who was going to be at the door when you opened it. Producers, recording artists and songwriting legends all stopped by, looking for hit songs- or wanting to write them with Harlan. One week, in 1992, I compiled a database on their computer of all of Harlan's songs that had been recorded to date. It was an amazing body of work. There were so many songs that had touched so many lives over the years. Strangely, all I can hear at this moment, in the aftermath of his death, is silence. I know I will hear the music again, but for now I pause and pity myself, for I realize how much I will miss the generous spirit and unique wisdom he imparted on hopefuls like myself. On that rare occasion when I played a song for Harlan and he said, "I wish I wrote that one", it didn't matter to me whether it got cut, went to #1 and made me a million bucks. It was enough to receive the nod from this sage of song, this writer of writers. To read Robert Oermann's Tennessean article about Harlan's extraordinary career, click here. To visit Harlan's website click here. My song "God's Gift", co-written with Mark Irwin, was released by the Fox Brothers in November on the Mercy Street label. The CD is entitled In This House and contains some great songs including covers of "Thank God For Kids" and "Teach Your Children". The Fox Brothers are an energetic Christian Country group with four-part harmonies, a sense of humor and a positive message. They have been voted "Entertainer Of The Year" several times by the Christian Country Music Association. The lyrics to my new song "Storyteller" were chosen in the finalist category of the Webstatic Poetry Contest recently. It was an honor to have written one of 33 poems that were chosen out of the 2,862 qualifying entries that were received. To read the lyrics to "Storyteller" click here. After five months of collaboration Ed Bruce and I just completed our first screenwriting project. It is based on the life of an old-time California cowboy who was unable to adapt to a rapidly changing world. Tragically, he "took his guns to town" in the 1930's and spent the remainder of his life in San Quentin. It will soon go to agents, actors and producers. James Garner and Robert Duvall are first on the list. We are hopeful that this script will find a good home. A note about Ed: We were first introduced in Dallas in 1979 by my old friend Ken Gunnell. I was twenty-one at the time. Ed had performed in Fort Worth the night before at Billy Bob's and was traveling with songwriters Ron Peterson and Ronnie Rogers. It was in January and that Sunday we were in the middle of an ice storm. We had all gathered at the home of casting director Shari Rhodes who was just beginning work on "Urban Cowboy" with John Travolta. We sat around pickin' and singin' for about ten hours and it was quite an experience. Ed has done everything from being an actor, songwriter, recording artist to hosting television programs. At one time he was the state symbol for Tennessee, appearing at special functions as the "Tennessean", dressed in buckskins and carrying a flintlock rifle. Ed first recorded on the Sun Records label in Memphis and later he was on MCA in Nashville where he was produced by Tommy West. Tommy produced Jim Croce's albums in the early 70's. Songs Ed has written include "Mammas, Don't Let Your Babies Grow Up To Be Cowboys", "Texas When I Die" and "My First Taste Of Texas". He went #1 with "You're The Best Break This Ole Heart's Ever Had". 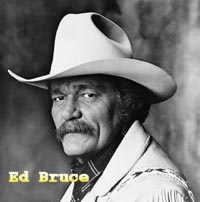 To visit the Ed Bruce website click here.